(Bloomberg) -- President Donald Trump has heralded a $10 billion Foxconn Technology Group factory in Wisconsin as proof of his campaign to create more American manufacturing jobs, but fresh uncertainty about the project could dent his already fragile hopes of winning a state central to his re-election bid. The Taiwan-based company said Wednesday it plans to shift the focus of a campus it’s building in southeast Wisconsin from manufacturing to research, while remaining committed to the 13,000 jobs it has promised to create there. When the project was announced from the East Room of the White House 18 months ago, it was viewed as a political triumph for both Trump and then-Wisconsin Governor Scott Walker. The reality has proved more complex. If the move away from manufacturing significantly cuts into the number of blue-collar positions, it could fuel criticism of a project already unpopular with many voters. There has been deep division in the state over the $3 billion in subsidies that were pushed by Walker, who personally lobbied Foxconn Chairman Terry Gou for the factory. Walker, once considered a rising star in the Republican Party, was defeated in the November election. The manufacturing campus, about 25 miles south of Milwaukee, had been presented to the state as a place to build screens for car dashboards, aviation and next-generation medical devices. The company is the biggest assembler of Apple Inc.’s iPhone. Democrats were quick to criticize. An administration official, who was granted anonymity to discuss the matter, said the White House would be disappointed if Foxconn cut back its investment. Public perceptions of the massive deal is likely to play a critical role in Trump’s 2020 re-election plans in Midwest states and especially in Wisconsin, where he beat Democrat Hillary Clinton in 2016 by less than 1 percentage point. 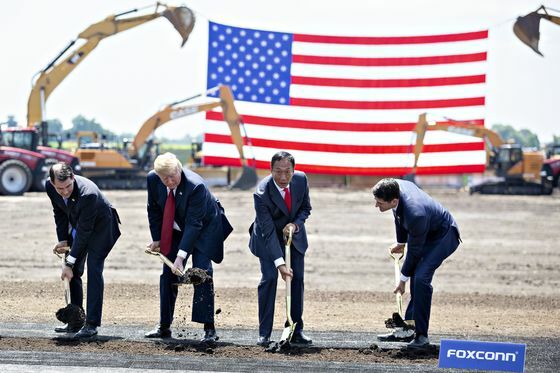 Even without the uncertainty of the Foxconn project, Trump faces a tenuous situation in the state, according to the most recent polling in the state. A Marquette Law School Poll earlier this month showed 49 percent of registered voters say they plan to “definitely vote for someone else” other than Trump in 2020, while 27 percent say they would definitely vote for him. Similarly, 46 percent strongly disapprove of how he is handling his job as president and 30 percent strongly approve. “Trump faces a challenging electoral situation in Wisconsin," said Charles Franklin, the poll’s director. While Trump’s support remains substantial among Republicans, with 60 percent strongly approving and 23 percent somewhat approving, independent voters have slipped away and 42 percent of them now strongly disapprove of his job performance. “Looking to 2020, he needs to hold that GOP base but also win back some significant independent support," Franklin said. The state tax breaks and other incentives represent what Walker called the largest economic development project in Wisconsin’s history. In exchange, the company has promised to create jobs with an average salary of nearly $54,000. Construction is underway at the site in Mount Pleasant, which is near the Illinois border. If both sides deliver fully, the economic package for Foxconn would cost roughly $230,000 per job. Walker, a two-term Republican governor, narrowly lost to Democrat Tony Evers, the state schools superintendent and a critic of the Foxconn subsidies. A Marquette poll taken before the election showed opinion nearly evenly split among registered voters on whether the state is overpaying the company. The Wisconsin Economic Development Corporation, a public-private agency that helped woo the company, said in a statement that taxpayers will be unharmed.